One of the first dishes I remember making in my 8th grade Home Ec class was coffee cake. This Barefoot Bloggers recipe, selected by Gwenn of Cooking in Pajamas, brought back these fond memories and reminded me of why I love coffee cake. This coffee cake is crumbly with a ribbon of cinnamon streusel running through the middle of the cake as well as crowning the top. I almost skipped the glaze for fear of it being overly sweet with the maple syrup and confectioners’ sugar, but the glaze is a perfect topping that complements the delicate flavor of the cake. Delish! One of the Barefoot Bloggers bonus recipes before I joined the group was the Contessa’s cheese platter. I’ve always intended to make this one, though. This “recipe” requires some thought and creativity…it’s not simply a cooking recipe with measurements that must be strictly followed. Rather, this recipe merely offers guidelines, but the rest is up to you! For my cheese platter, I wanted to have an interesting selection of a variety of flavors, so I chose cheeses made of goat’s milk, sheep’s milk, and cow’s milk. The Montchevré Camembert La Chevriotte is a mild and creamy soft-ripened goat cheese reminiscent of Brie. Manchego, a firm cheese with a buttery flavor made in the La Mancha region of Spain from the milk of Manchega sheep, is one of my favorites. Lastly, I chose the Rosenborg Castello Extra Creamy Danish Blue Cheese, which is a mild blue cheese with a rich, buttery, and tangy flavor. I served my cheese platter with an assortment of crackers, local honey, fresh grapes, ripe strawberries, and dried apricots. Go to the best cheese shop in town and ask the person at the counter which cheeses are ready to serve. Taste everything; they expect you to. We all know that the Brie may look terrific, but it can be underripe and tough or overripe and ammoniated. You want only the freshest cheeses that are perfectly ripened. Take them home, refrigerate them, and then bring them to room temperature a few hours before serving. Second, be sure to have a platter or wooden board that is flat and large enough to hold the cheeses without crowding them. Arrange the cheeses with the cut sides facing out, and with several small cheese knives, maybe one for each type of cheese. Third, to finish the platter, add sliced breads or crackers, and green leaves. I use either lemon or galax leaves, which you can get from your florist. If you have a garden, any large flat leaf like hydrangea looks beautiful, but be sure they aren't poisonous and are pesticide-free! Overall, the simpler the design, the better the platter looks. Group each kind of cheese together and add one large bunch of green or red grapes in the center to create a visual focal point. Fill in the spaces with lots of crackers or small slices of bread. This one-pot dinner is a tasty and fairly healthy man-meal of chicken and potatoes. There’s nothing difficult about this dish. Once the chicken is cooked and cut into pieces, the dish comes together quickly. The flavors of the roasted chicken, the crispy potatoes, and the wilted spinach blend well together. Preheat oven to 450 degrees F. Place chicken breasts on a rimmed baking sheet. Drizzle with 2 teaspoons olive oil and season with salt, pepper, and thyme. Roast until cooked through, 35 minutes. When cool enough to handle, discard skin and bones; cut chicken into bite-sized pieces. Meanwhile, in a medium saucepan, bring potatoes to a boil in salted water and cook until tender when pierced with a knife, about 15 minutes; drain. In a large skillet, heat 4 teaspoons oil over medium-high. Add 2 large shallots, diced small, and cook, stirring, until softened, 3 minutes. Add 2 garlic cloves, minced and cook 30 seconds. Add potatoes and cook, stirring often, until browned, 7 minutes. Add 2 tablespoons water, scraping up browned bits from pan with a wooden spoon. Cook, stirring often, until potatoes are golden brown, 5 minutes. Add chicken and ½ pound spinach, trimmed, washed, and coarsely chopped, and cook, stirring, until spinach wilts, about 2 minutes. Season to taste with salt, pepper, and fresh lemon juice. 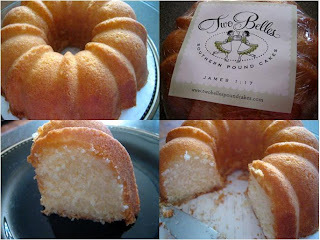 Sharon Crow and Caroline Aderholt, of Two Belles Pound Cake, have got something special in their Southern pound cakes! These two ladies from Alabama clearly take pride in their cakes. “From the beginning we wanted to honor our heritage by honoring the Southern ladies who influenced our lives. Many of our recipes come directly from the ladies for whom they are named.” Each cake is homemade with quality ingredients and flavored with love in every bite. These pound cakes are available for online orders, but you’ll have a tough time trying to select a cake among the key lime pound cake, the cream cheese pound cake with chocolate chips, the orange and lemon pound cake with orange glaze, the dark chocolate pound cake with chocolate glaze, or any of the other cakes—they all look mouthwatering! McHubby and I tasted The Annemarie Pound Cake, a best-selling cake with coconut, almond, and rum flavorings. The cake came wrapped in plastic and tied with a black ribbon with white bordered stitching, like a beautiful gift that I just couldn’t wait to open! The three flavors of this dessert marry together perfectly and aren’t overpowering at all. The cake is so moist and fluffy light with a hint of a crunchy glaze. Each bite is simply heavenly! This side dish is a fun and tasty way to prepare zucchini. It really doesn’t take much time or effort to make, either. The outcome is a beautifully browned and buttery soft green-speckled pancake. What a great way to eat your vegetables! Heat a large (10 to 12-inch) sauté pan over medium heat and melt ½ tablespoon butter and ½ tablespoon oil together in the pan. When the butter is hot but not smoking, lower the heat to medium-low and drop heaping soup spoons of batter into the pan. Cook the pancakes about 2 minutes on each side, until browned. Place the pancakes on a sheet pan and keep warm in the oven. Wipe out the pan with a dry paper towel, add more butter and oil to the pan, and continue to fry the pancakes until all the batter is used. The pancakes can stay warm in the oven for up to 30 minutes. Serve hot. This Barefoot Bloggers selection, brought to us by Josie of Pink Parsley Catering, was a wonderful combination of flavors—tomatoes, garlic, basil, and cheese. It was surprisingly easy to prepare, and it smelled like an Italian kitchen as it baked in the oven. I was a bit disappointed with how soggy it was—not sure if the bread hadn’t toasted enough or if the tomatoes were just extra juicy. Perhaps it would have been better if the bread wasn’t as fresh. We still enjoyed it, nevertheless. Heat 3 tablespoons of olive oil in a large (12 inch) sauté pan over medium heat. Add the bread cubes and stir to coat with the oil. Cook over medium to medium-high heat for 5 minutes, stirring often, until the cubes are evenly browned. I fell in love with gelato during our vacation in Italy a few years ago, and who doesn’t love Nutella? I must confess that I had to make this recipe twice, though, not because I messed up the first batch…it was because McHubby and I ate the first batch too quickly and I didn’t get a proper photo. So, happily, I simply had to make it again, you know, for the blog. So what’s the difference between gelato, ice cream, and other frozen delights? According to A Big Slice, ice cream is made from cream and varies between 10-15% butterfat. The big difference between gelato and American style ice cream is in the amount of air that is whipped into the product (20% air for gelato and up to 60% air for ice cream). The result is a denser and more intensely flavored dessert. Regardless of the science behind this dessert, it is perfectly creamy and divine! You’ve been warned, though…be prepared to make a double batch. In a saucepan combine the milk, cream, and ½ cup sugar over medium heat. Cook until the sugar dissolves, about 5 minutes. Meanwhile, in a medium bowl whip the egg yolks with the remaining sugar using an electric mixer until the eggs have become thick and pale yellow, about 4 minutes. Pour ½ cup of the warm milk and cream mixture into the egg mixture and stir. Add this mixture back into the saucepan. Cook over very low heat, stirring constantly, until the mixture becomes thick enough to coat the back of a wooden spoon, about 7 to 10 minutes. I love sweet potatoes, prepared any way, and these “fries” are a nice healthy alternative as a side dish with your favorite grilled burgers. Even better, these “fries” only require four ingredients! Be careful, though, because you’ll keep coming back for more! Preheat oven to 425°F. Line a baking sheet with aluminum foil coated with cooking spray.Spread the sweet potato strips out onto the baking sheet in a single layer, coat with olive oil and sprinkle with salt and spices, turning them over to evenly coat on all sides with oil and spices.Bake for 30 minutes, turning every 10 minutes with spatula. Serve warm. In the mood to grill dinner tonight, McHubby and I wanted something other than regular burgers. We adapted this recipe to include grilled portobello mushrooms for a cross between a veggie burger and a grilled cheese sandwich, but you'll never miss the meat! The bread is perfectly toasted and crisp, and the grilled vegetables are a nice smoky contrast against the creamy, melted cheese. Light a grill. Brush the portobello mushrooms and zucchini slices with olive oil and season with salt. Grill over high heat until nicely charred and just tender, about 2 minutes per side. Cut each zucchini slice in half crosswise. Grill the sandwich thins, cut side down, over low heat, until just soft, about 30 seconds. Turn and grill until the bread starts to brown, about 1 minute. Spread the cut sides of the bread with the pesto. Layer 1 slice of cheese, portobello mushroom, zucchini, and 1 more slice of cheese on the bottom halves of each muffin. Close the sandwiches and grill over low heat, turning, until they’re crisp on the outside and the cheese is melted, about 4 minutes total. Cut the sandwiches in half and serve right away. After making the Eggplant Parmesan Rolls, I had leftover filling, made of chopped Swiss chard and ricotta cheese, which I thought would make a tasty filling for a calzone. You can use store-bought pizza dough or make your own. I used the pizza dough recipe from this Barefoot Contessa recipe. You can always freeze any leftover dough and use later. The best thing about pizzas and calzones is your own creativity. You can add other ingredients—like mushrooms, spinach, sausage, or anything else—to develop your favorite flavors. Preheat oven to 450 degrees F. Lightly oil a rimmed baking sheet. On a lightly floured work surface, roll each piece of dough into a 10-inch round. Divide the filling among the bottom halves of the dough rounds, leaving a 1-inch border. Add 2 ounces of mozzarella and sprinkle ¼ teaspoon on top of the filling for each calzone. Fold top half of each round over filling and roll and pinch edges to seal. Carefully transfer calzones to baking sheet, and brush tops lightly with oil and season with salt and pepper. Bake until calzones are golden brown, 15-18 minutes. While calzones are baking, warm marinara sauce in a small saucepan over medium heat. Serve with calzones. I love eggplant and enjoy finding new ways to prepare it. This recipe is a bit more involved—more for weekend cooking than during the work week—but it can be prepared ahead of time. The eggplant slices are roasted to make them flavorful and pliable, and a mixture of ricotta cheese and chopped Swiss chard becomes the filling for the rolls. Serve over pasta for a great dinner. Cover bottom and sides of each of 2 large colanders with 1 layer of eggplant slices; sprinkle generously with coarse salt. Continue layering eggplant slices in each colander, sprinkling each layer with coarse salt, until all eggplant slices are used. Place each colander over large bowl; let stand at least 30 minutes and up to 1 hour. Rinse eggplant slices to remove excess salt; dry thoroughly with paper towels. Position oven rack 5 to 6 inches from heat source and preheat broiler. Line 3 large rimmed baking sheets with parchment paper. Arrange eggplant slices in single layer on prepared baking sheets. Brush both sides of eggplant slices with olive oil. Broil 1 sheet at a time until eggplant slices are tender and beginning to brown, watching closely and removing eggplant slices as needed if cooking too quickly, 3 to 4 minutes per side. Remove baking sheet from oven and cool eggplant while preparing filling. Lightly oil 15x10x2-inch glass baking dish. Spread half of tomato sauce evenly over bottom of dish. Divide chard-ricotta filling among eggplant slices, placing about 1 heaping tablespoon filling in center of each. Starting at 1 short end of each, loosely roll up eggplant slices, enclosing filling. Arrange rolls, seam side down, atop sauce in baking dish. Spoon remaining tomato sauce over. Place mozzarella slices in single layer over rolls. Sprinkle with remaining ¼ cup Parmesan cheese. DO AHEAD Can be made 1 day ahead. Cover with foil and chill. This savory side dish is a beautiful combination of flavors—shallots, garlic, tomatoes, wine, and fresh herbs—against the backdrop of cannellini beans. So tasty, this dish goes well with fish. I served it with Flounder Fillets with Spinach-Parmesan Stuffing. I love fish, and these stuffed, rolled fillets are delicious. This recipe looks more complex than it is. But if you’re pressed for time, you can always take a shortcut and used chopped frozen spinach instead of wilting and chopping the fresh spinach. The fillets are easy to assemble and can even be made ahead of time. Heat the oil in a large skillet over medium-high heat. Add the garlic and cook for about 10 seconds, stirring constantly. Add the spinach in batches and cook, stirring frequently, until it is just soft, about 5 minutes. Season with salt and pepper. Place the spinach on a plate. Drain any excess water or liquid out of the spinach by taking another plate of the same size and pressing down on the spinach and discarding the liquid. Finely chop the drained spinach and set aside. Position a rack in the middle of the oven. Preheat the oven to 400 degrees F.
Pour ½ cup of the wine on top of the fish and bake for 12 minutes. Remove from the oven and preheat the broiler. If the pan is dry, add another ¼ cup wine to the bottom of the pan. Add the butter to the wine in the bottom of the pan and broil the fish for 2 minutes. Remove from the oven and sprinkle the fillets lightly with the breadcrumbs. Spoon a tablespoon of the liquid from the bottom of the pan on top of the fish to moisten the breadcrumbs, and broil for another 3 to 4 minutes. This dish was as super quick and easy to make as it was tasty, perfect for a weeknight dinner after work. Shrimp take only a few minutes to cook, plump and pink—seriously, any more than that and it’s overcooked and rubbery. This dish serves up well with rice or pasta.